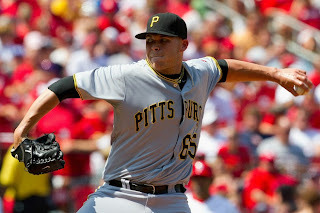 The PITTSBURGH PIRATES have begun their annual trek back to the afterthoughts of most Pittsburgh sports fans, passing two important milestones over the weekend: the trade deadline and the start of training camp. Their play this weekend certainly won't help interest levels. The final carnage for their three-game series at St. Louis included losses in all three games, and a combined score of 21-2, with a 9-1 loss on Sunday. In the process, the Bucs fell to a season-worst 36-68, and their road record fell to an unfathomable 13-42. 13-42! The 59-47 Cincinnati Reds invade PNC Park tonight, as Travis Wood (1-1, 2.87 ERA) kicks off the series against Ross Ohlendorf (1-8, 4.35 ERA). Cincinnati has won four of their last five, and swept a three-game set from the Pirates on May 10-12. THE PITT PANTHERS came away with a 92-52 victory against the South Regional All-Stars at Neptune Stadium in Cork, Ireland on Sunday. Freshman JJ Moore led the way with 14 points, while Talib Zanna and Gilbert Brown had 10 each. DESHEA TOWNSEND has signed with the Indianapolis Colts. The 34-year-old spent 12 seasons in Pittsburgh. FLOZELL THE HOTEL looks like he'll be playing right tackle and not taking Max Starks' spot on the left side. Why mess up 2/5 of the line when you don't have to? JEFF REED sounds like he's in backtrack mode after his comments/accusations this weekend. JASON WORILDS carried Larry Foote's pads after practice on Sunday. Wonder if news of that trickled down to Dallas? JOHN CLAYTON posts his early observations from Steeler camp, including the warm reception for #7. DARRELLE REVIS's holdout from Jets camp has a distinct Pitt flavor, as he is being advised by former Panther standout Sean Gilbert, who is his uncle. Does it make me less of a fan because i had no idea that Deshea Townshend had left the Steelers? Seriously, I had no idea that the guy wasn't on our roster right now. None. I'm in the same boat. I'm so used to him being back there, it was a shock to find this out over the weekend. Deshea is just one of those guys. It's gonna be real weird to see him in another uniform in week 2. Townsend is only 34? I thought he was at least 36. I wonder if Chip has cancelled his 2011 World Series tickets? A week ago, the Pirates had back-to-back games scoring over 10 runs and he stood back admiring the journey. The law of 'reversion to the mean' reared its ugly head. But hey, the front office was making moves at the deadline, so all is well. I am still shocked to see so many people stick up for this team's every move and become downright offended that any of us would even dare suggest the FO has anything other than winning in mind. Honestly, I don't see how it is unreasonable to be skeptical of this organization due to A.) reluctance to spend money and B.) ineptitude to evaluate major league talent. It just seems that every year, if someone who makes more than the minimum is doing well, he is gone for a couple of mid-ceiling late 20's career minor leaguers. Maybe I am just imagining that is the SOP, but it hasn't worked in the past thus I don't see a reason to lead the blood rush to my weiner over it now. A) Edit: Reluctance to spend on major league payroll. The investment in the draft is there. The investment in Latin American scouting is there. We haven't seen it at the major league level yet, and while there's room for skepticism until we see it, I think the out of control paranoia over it is fairly ridiculous, especially considering the players the Pirates have chosen not to spend on. Let's face it, by and large, NH sold all of these guys at their highest value. If this were the Steelers, we'd be praising them for knowing when to cut the cord. I understand that they're NOT the Steelers, but at the very least I think people need to give them credit for not running into foolish contracts to placate the fan base. B) That is what people should be focusing on when evaluating NH, not the payroll. I almost thought you were talking about the Steelers, but then I realised you were talking about the Bucco's and I'm just too damn tired to argue anything for or against them. You do realize that the Bucs added payroll for this year and next with the trades they made, right. OK, yes, they added Snyder's big contract, $3M of which is being picked up by AZ. They also got rid of Dotel's $4.5M club option and Lopez before the arbitration hearing required them to pay him a reasonable salary for his performance. So, what, they add a whopping $1M to the lowest payroll in MLB. Excuse if I am not flush with fever. I agree that a lot of those guys were sold at their max value, but are you honestly satisfied with the returns, either? I can see the argument for trading those guys, but it isn't like we are getting productive contributors in return. Huntington and his people have not done a good enough job in evaluating talent as far as I can see. Hopefully, Taillon and Allie are signed and we can have some hope for a starting rotation, but their arrival is years off. By that time, it will be Cutch and Walker on the trading block. Insert new 5-year plan, rinse, and repeat. Yeah Burress but we can trade Cutch and Walker and Alvarez for tons of great prospects, and the Pirates minors will be loaded with talent, and there will be lots of optimism with all these young guys, and then 5 years from the 5 years from now is what everyone can look forward to, and the zzzzzzzzzzzzzzzzzzzzzzzzzzzzzzzzzzzzzzzzzzzzzzzzzzzzzzzzzzzzzzzzzzzzzzzzzzzzzzzzzzzzzzzzzzzzzzzzzzzzzzzzzzzzzzzzzzzzzzzzzzzzzzzzzzzzzzzzzzzzzzzzzzzzzzzzzzzzzzzzzzzzzzzzzzzz. By the way Nate are you trying to get rid of any of your Pirates tickets? If you give me $50 I'll go to a game with you (only for a few innings though). I'm a transplanted Pittsburgher in Indiana, so no, I don't have any Pirates tickets. It seems like Bob Smizik and his followers are the only ones not impressed with the return the Bucs got for Dotel. Keith Law, John Sickels, Jim Callis and Kevin Goldstein all saw it as a steal for the Pirates, and it's their job to evaluate prospects. I'm gonna go with what they think over the yinzer at the bar.